The road has been paved and repaired and is fully open right now. The Caltrans web site might show Highway 39 closed before the campground turn-off however that is not correct. Bicycle riders, hikers, joggers, and long-distance runners are on Highway 39 all the way from the bottom of the mountain in Azusa to the top of the mountain at Angeles Crest Highway (2) so people driving cars need to be careful to see and avoid everyone else using the highway since there have been a fairly high number of deaths on the road this year. Highway 39 ends at a Caltrans gate about 1 mile North of the Crystal Lake turn-off. Another 7 miles of Highway 39 is closed to all vehicles except for emergency vehicles. 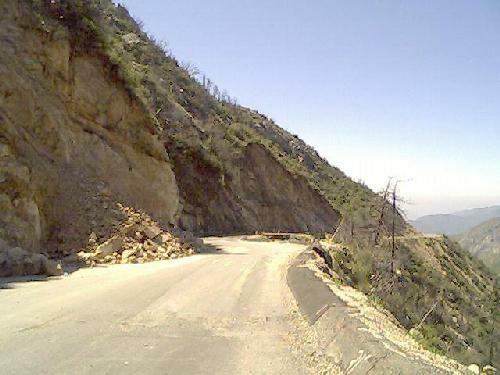 The closed section eventually meets up with Angeles Crest Highway (Highway 2) however the only access is on foot or on bicycle, cars are not allowed on the closed section because the highway remains damaged. This web site is not operated or maintained by the US Forest Service, and the USF does not have any responsibility for the contents of any page provided on the http://CrystalLake.Name/ web site. Also this web site is not connected in any way with any of the volunteer organizations that are mentioned in various web pages, including the San Gabriel Mountains Trailbuilders (SGMTBs) or the Angeles Volunteers Association (AVA.) This web site is privately owned and operated. Please note that information on this web page may be inaccurate.